SOFIA, Bulgaria (BulgarianMilitary.com) – Do not be under a delusion. Bulgaria is not such an important factor in the UN and NATO, despite our membership. Our country turned out to be in the right place at the right time as far as the international arms trade is concerned. And although Bulgaria has neither breached the UN Arms Trade Treaty, nor threatened with its activities its NATO membership, the Bulgarian companies in the sector “military production” have been experiencing their Renaissance over the recent years, thanks to deals, breaching some major rules. Everything began in 2006 after the murder of Abu Musab Al-Zarqawi, when the Egyptian Abu Ayyub al-Masri succeeded him and renamed the terrorist organization to ISI – Islamic State of Iraq. 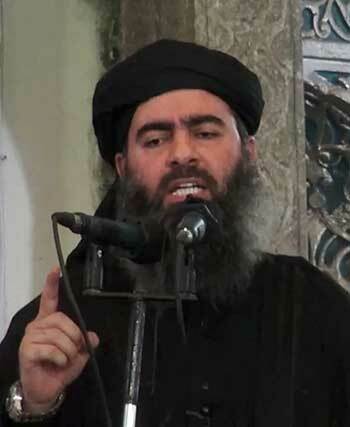 Four years later Masri followed the destiny of Zarqawi and he was succeeded by Abu Bakr al-Baghdadi. Now we ask ourselves – why CIA and GRU did not make a military-political analysis of the emerging terrorist group right from the very beginning, provided that there were sufficient reasons for that to happen. In the years when a civil war ranged in Syria on one hand, and ISIS rampaged with its laws on the other hand, the United States and Russia saw different opportunities. The United States wanted to overthrow one more “dictator”, Russia – to retain the legitimately elected president. This, however, is the version for the public. In fact, the USA saw the unique opportunity to oppose to the Russian Federation by increasing the existing in the region conflict, by which to disturb planned big arms supplies of RosOboronExport. However, it could not do that directly and that is why it had to create the so called Black Sea Road, i.e. a way in which to do what they had planned, and namely – armament and training of the National Army for the Liberation of Syria, which, through American money, to oppose the Syrian dictator Assad. They knew that Russia would support the government of Syria, through which it would enter a “research mode” from a distance of thousands miles. An increase of the US military budgets followed in the next years, as well as purchases of weapons and ammunition on a mass scale from the former socialist countries, including Bulgaria. Black Sea Road has an elementary logic – in order to be saved big expenses for transportation of weapons and some “international legal obstacles” to be avoided, the Pentagon purchases weapons from the former socialist countries, and by using Bulgaria and Romania as a distribution hub, it transports them to Turkey, Jordan and Kuwait. On its part, the latter three countries equipped the rebel forces in Syria through which they extended their existence. But in order the picture to be complete, big part of those weapons fell into the hands of ISIS. The reasons for that are a lot, but the most important one seems to be the Islamization of a big part of the then service members and their desert to the terrorism. And they did that with the weapons, which were assigned to them. Islamization, which was again slumbered away by Russia and the United States. Was it?! How Bulgaria benefited from that whole cycle? If you think that it is about ten or twenty million dollars, you do not know the ideological dimensions of the idea of maintaining exactly that conflict. 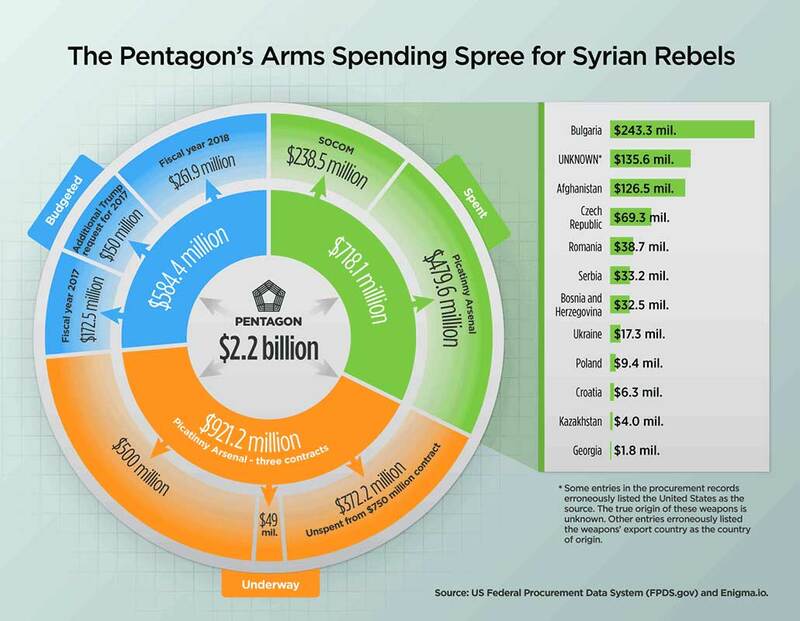 The Pentagon, though its subdivisions and companies, has bought weapons and ammunition, only from Bulgaria, at the total amount of $243 million, and our country is within the top positions of the foreseen for the purpose $2.2 billion. As of the moment, it has been spent $718 million from the whole planned budget, and only one US company Picatinny Arms has prepared contracts at the amount of approximately $900 million more. In this way, the Bulgarian companies in the defence sector have a serious market without having wanted it. Of course, all this would not have been a problem, if a big part of the Bulgarian arms were not found in the hands of the defeated military squads of ISIS. The interpretations whether Bulgaria is guilty or not are useless. We will not save you the answer. You will just find it in the lines below. Who gave Bulgarian arms in the hands of the terrorists? We say that every day – America. But it seems that we have stopped using evidences. And there are such mainly against several American companies, as well as against companies from Saudi Arabia. But there are also serious evidences related to the Pentagon. Let’s review them one by one. With the entering of ISIS in Syria, the USA developed a program for equipment of the Syrian rebels against Assad, which is called Syria Train and Equip. For the purpose, a big quantity of weapons and ammunition had to be purchased from the subdivision in the Pentagon – SOCOM (The Special operations command). SOCOM started even in October 2015 with the delivery of 50 tons of ammunition and missiles, and that was only the beginning. According to the report of the Organized Crime and Corruption Report Project (OCCRP), it followed a purchase of weapons and ammunition at the amount of $238 million from Bulgaria, Bosnia and Herzegovina, the Czech Republic, Kazakhstan, Poland, Romania, Serbia and Ukraine. According to the requirements of the Pentagon, “the list of purchases” continued to be filled in with thousands of AK-47s and RPGs. Although, SOCOM was not included and acknowledged in the Syria Train and Equip Program, within a journalistic investigation, the Pentagon had to officially acknowledge that the subdivision in question had been really assigned the task for delivery of weapons and ammunition for the Syrian rebels. SOCOM entangled in some more scandals with weapons, and the most obvious one was the purchase of 48 RPGs from VMZ Sopot. The problem is not that weapons have been bought, but the document, which is presented as “End User Certificate” (EUC`s). According to the approved international law, NATO standards and UN Arms Trade Treaty, that certificate has a specific structure, in which it shall be obligatorily mentioned two things – who the end user is and a declaration that the end user will not resell or transfer the purchased by it arms. 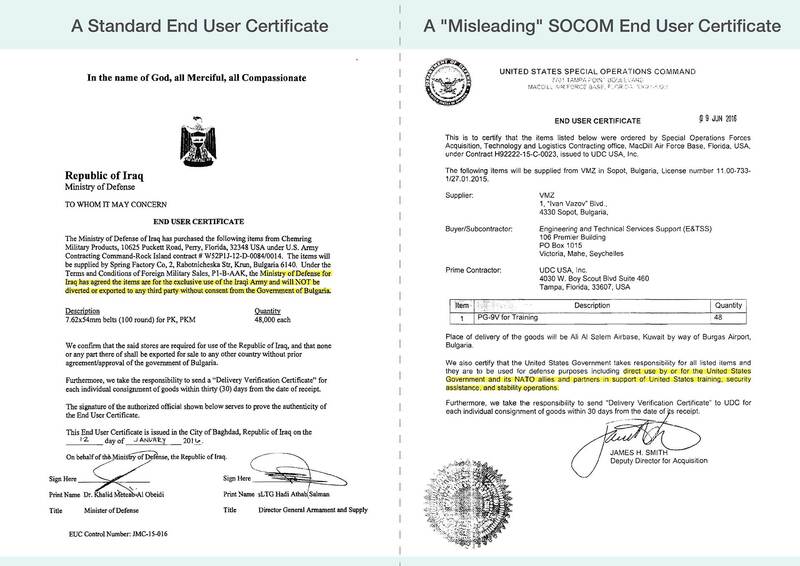 However, SOCOM presents a questionable document, which does not at all guarantee that, and it even allows it. Thus, the Pentagon interprets its interest in its own way and drives to bay the UN and NATO member states. Another supplier of the Pentagon is the company Picatinny Arsenal. Headquartered in New Jersey and not so big, it has a serious lobby in the face of the republican congressman – Rodney P. Frelinghuysen, who has even shared a special place for Picatinny Arsenal on his web page. It fell into the field of vision of OCCRP, after they had noticed that the Pentagon had corrected, through erasing, the final destination of the weapons, purchased from Bulgaria. According to initial information, Iraq and Syria were the final delivery points, but after the intervention of the Pentagon they were deleted. 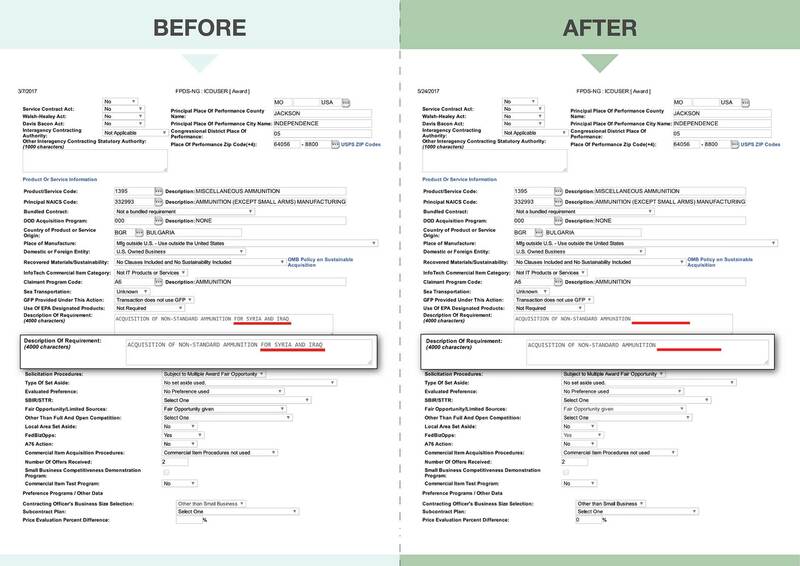 Fortunately, the OCCRP investigative journalists had cleverly copied the original document, which we can show you. 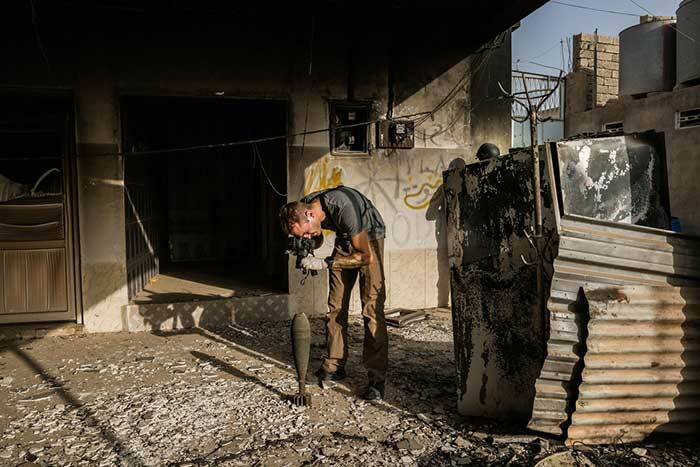 In the same time, another independent organization – Conflict Armament Research (CAR) went even farther and went to a place in Syria, where it filmed and categorized the weapons taken away from ISIS. 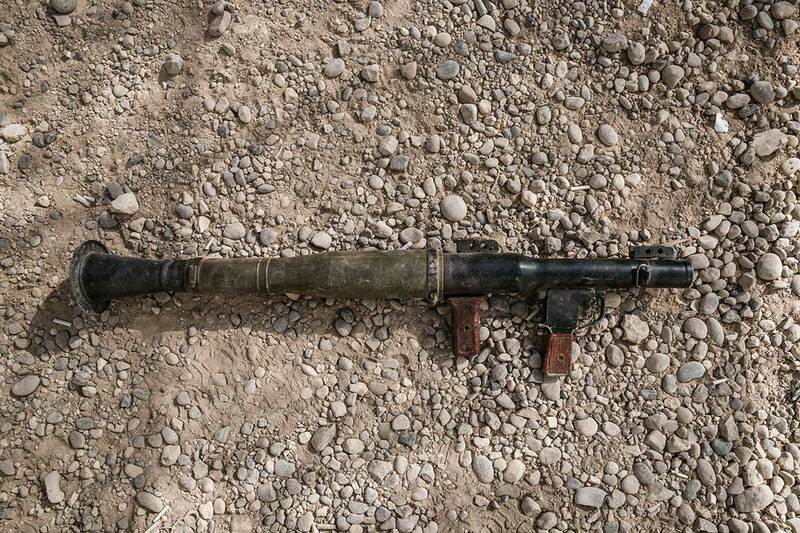 Thus, for example, in 2016 the Iraqi police forces took away from the ISIS forces a rocket-propelled grenade produced in Bulgaria – 9M111MB-1 ATGW, about which Bulgaria admitted that it was exported in 2015 and the end user was the US department. As of the moment there is not an answer from the USA how that weapon has turned out to be in the hands of ISIS. But the most striking case is the purchase of the PG-7T 40 mm grenade by the US company Kiesler Police Supply with an explicit clause for non-transference of the grenade in question. Bulgaria has confirmed that the grenade has been sold to that company. As of the moment neither the company, nor the US government has explained how it turned out to be part of the equipment of ISIS in the region of Al Hasakah, Syria. The examples are a lot and we do not see any sense in listing them, and the case in point is not always America or American companies. In the report, Saudi Arabia is also mentioned with the same activities, reviewed by now. But the overall picture acquires its nuances. The silence of NATO and the UN is “a bonus” to Bulgaria. Actually, along the trading chain of the sold Bulgarian arms we have two major players – the Bulgarian military manufacturers and the US purchasers. However, the hidden participants are two organizations – the UN and NATO. Their inactivity, silence and non-undertaking of measures on these deals makes them guilty as much as the USA or Saudi Arabia. Through those activities of theirs and by creating a precedent, they allow many future similar deals to happen. This is already dangerous, because it is a serious prerequisite for corruption at very high international level, which to affect the lives of many people. On the other hand, the inactivity of the two organizations threatens the Eastern European governments that sell weapons and ammunition to be at risk of non-compliance with the international law. So far there has been no a reverse reaction, and Bulgaria continues to sell to US companies, but till when? Could this partnership at one point turn out to be too “expensive” for the Bulgarian state? And last but not least, what will happen with those weapons after ISIS is defeated?